These versatile swing cylinders/clamps can be used as single or double acting rotating clamps, or push/pull cylinders. The piston in the Swing Cylinders rotate 90° to the right, but may easily be changed to 90° left rotation, or to no rotation at all. 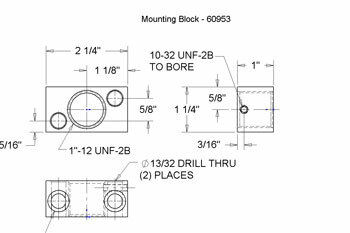 Can be mounted using four #10 cap screws or the 1"-12 thread on the O.D. of the cylinder. Optional components include the threaded mounting bracket and jam nut shown below. 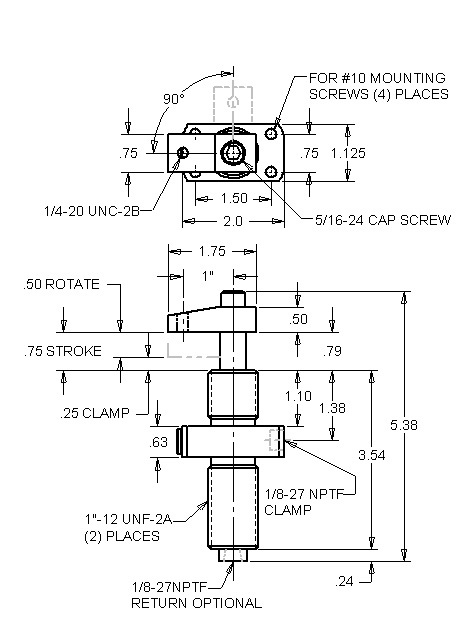 Maximum recommended flow rate is 20 cubic inches per minute per clamp (approximately 1 second clamp time). Available in 3D Solid Models from the web.